Send family and friends this sweet gift of fortune for their birthday celebration! This is a sweet Gift of Fortune for any Birthday Celebration! Our festive Take Out Pails are made from a semi-translucent, soft vinyl for a beautiful finish. Each fun box contains twelve of our gourmet hand-dipped and decorated Happy Birthday Fortune Cookies nestled inside among festive tinsel and shred. Each crisp vanilla fortune cookie is dipped in your choice of fine Belgian Chocolates: Dark, Milk or White, or, for a change, try our Caramel-dipped cookies. If you have a hard time choosing, no worries, choose our Assortment to receive an equal amount of each! 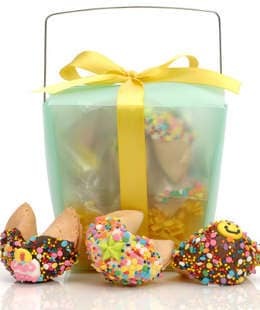 Individually wrapped in separate cellophane bags and heat sealed at both ends for freshness, these cookies are perfect for sharing...or for enjoying good fortune for several days! A beautiful ribbon accentuates the presentation.